Nota Bene Publishing and Aurora Group s.r.o. 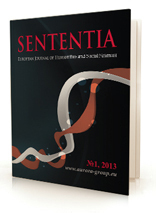 present issue 2'2013 of the "SENTENTIA. European Journal of Humanities and Social Sciences"